Please Tell me I'm not the only one who knew about this. During the run of Legend of Spyro Eternal Night, Wendy's promoted the game by having Kids meal toys. And I think a Spyro mini-maze. Did anyone else have these as a kid? 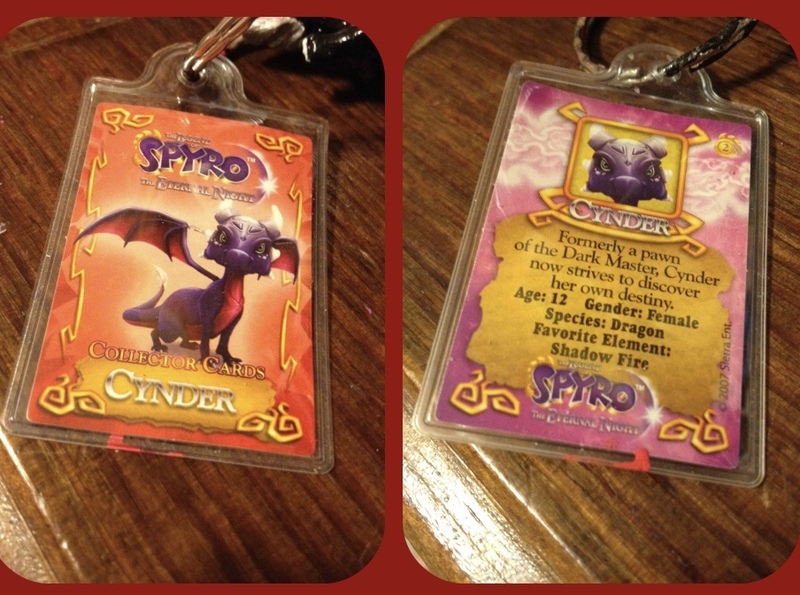 I remember those, on the Cynder card they revealed her age and Spyro's. I really need to get those. Since it's the only Official Merch for Legend that i'm aware of. Also Crystal how old are they? I've been wondering about that. 12 years old in ANB/TEN and 15 in DOTD. Huh... well dig a little further to see if these were for sale anywhere (ebay is best bet) Wendy's was not the only ones to do this. Sources go back and forth on it but apparently Spyro and Crash in their Cross over"game" they had toys for that as well. However I do not have visual proof of this but does someone out there know if that was real? OH OH OH Just found as I was typing this there is a handheld Electronic game, you those things you found in the bottom of the cereal box that you begged your parents to get but when you found out how to beat it you threw it away. Ya, McDonald's made that and Ebay is still the way to go in finding these. Interesting to see Spyro having a "confirmed age", makes me wonder his age in the Classics and Skylanders in some extent. I'm aware of some of the toys, however some are very rare to find, I think? Although I had a Bipedral Spyro plushie, but he's gone and I never knew what happend to the plush. That's what the secret message says. 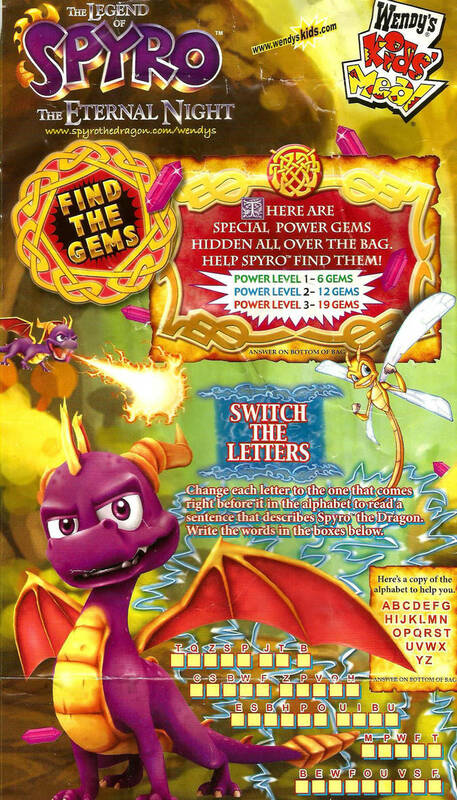 They really know Spyro don't they? 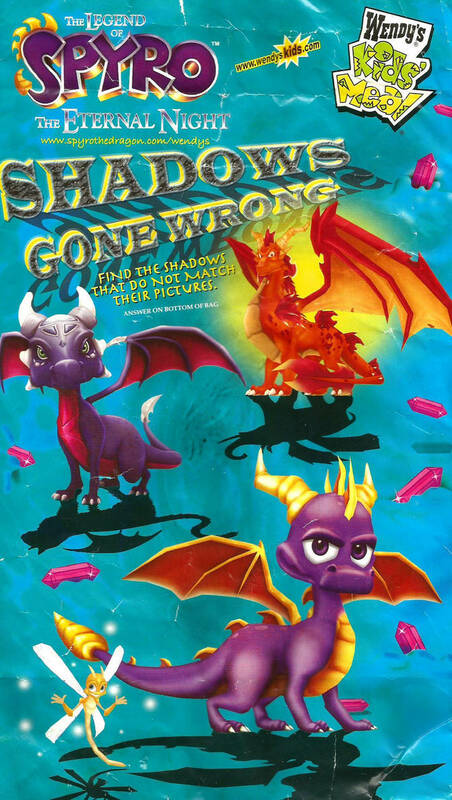 wish there was Reignited Trilogy Kids Meal Toys prrt. Although it's kinda weird to see puzzles like that, but that's just me.